Ovechkin scored a goal and picked up an assist in Wednesday's 5-3 win over the Flyers. To get things going, Ovechkin tallied the primary helper on Tom Wilson's first-period goal. Then, early in the middle frame, the Caps' captain scored his 16th power-play goal of the season to give Washington a three-goal lead. The 33-year-old just wrapped up a scorching February that saw him find the scoresheet in 11 of 13 games. 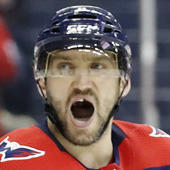 For the season, Ovechkin is up to 46 goals and 77 points.